Veliko Turnovo is located 250km away from the capital Sofia, at the foot of the Northern fore-Balkan mountain range. Often referred to as the "City of the Tsars", Veliko Tarnovo is located on the Yantra River and is famously known as the historical capital of the Second Bulgarian Empire, attracting many tourists with its unique architecture. Historians date Veliko Turnovo back to 4th millennium B.C. 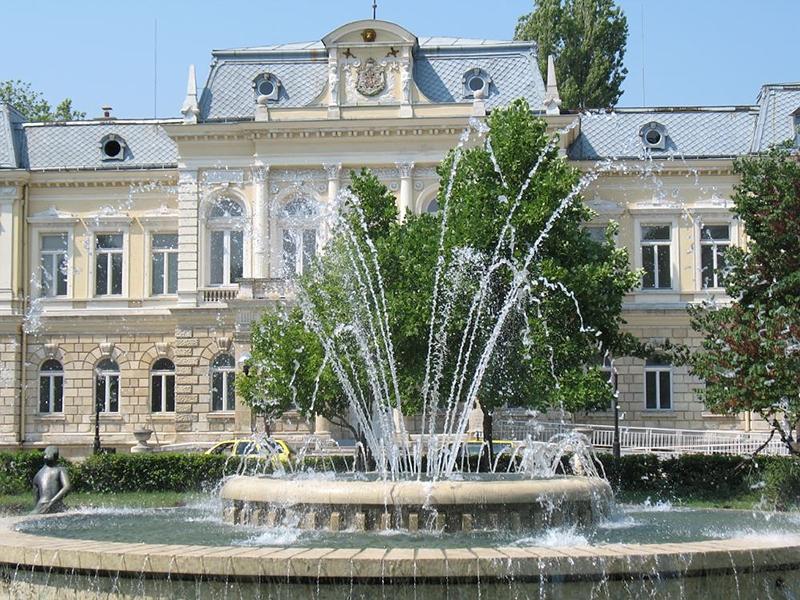 The town has inherited centuries-old Prehistoric, Thracian and Antique culture. The royal city of Veliko Turnovo, the capital of the Second Bulgarian Empire (1185-1393) was a town where 22 empires ruled and forged the destinies of Bulgaria. Picturesquely situated on three hills - Tsarevets, Trapezitsa and Sveta Gora, for 800 years the town has been mirroring its regal face in the waters of the meandering Yantra River. The hills are circled by the deep-cutting river above whose magnificent gorges sheer rocks rise into the sky. Perched one above the other on the rocks, the houses reach right down to the river bank. Tsarevets hill is a natural inaccessible fortress where the royal palace, the Patriarch's Cathedral, and a multitude of small cross-domed churches were built. A central place is occupied by the ruins of the royal palace. Baldwin's Tower, where Baldwin, Count of Flanders and Constantinople's first Latin emperor languished and died, is in the hill's south-eastern part. The tower commemorates the victory of the Bulgarian tsar Kaloyan over the knights of the Fourth Crusade in 1205. It was restored in 1930-1932. Trapezitsa hill rises on the opposite bank of Yantra River. The hill housed residences of the boyars, some public buildings, and churches above all. The homes of the urban population were located at the foot of the two hills, outside the fortress walls and near the river. Remains of fortress walls, embrasures, towers and fortified gates have been discovered here. 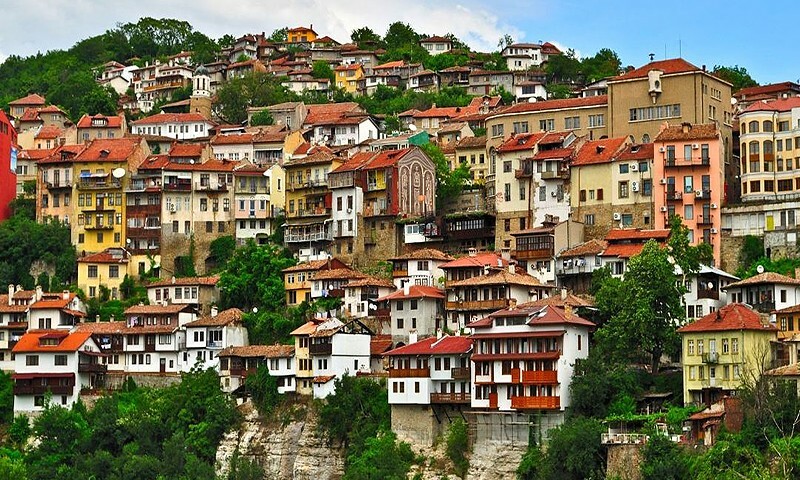 During the Middle Ages, the city was among the main European centers of culture and gave its name to the architecture of the Tarnovo Artistic School, painting of the Tarnovo Artistic School, and to literature. Several mediaeval churches dating from the time of the Second Bulgarian Empire have been preserved in the Assens' quarter. The Holy Forty Martyrs church preserves the oldest Biblical calendar in the Eastern Orthodox world, along with the in-built columns of khan Omourtag and of Tsar Ivan-Assen II - two of the few surviving written monuments of Bulgarian mediaeval history. The St. Dimiter of Salonika church has a sculptured and picturesque exterior with brick decorations. Besides being the city's oldest church, it is also one of the earliest examples of the Veliko Turnovo Literary & Painting School. 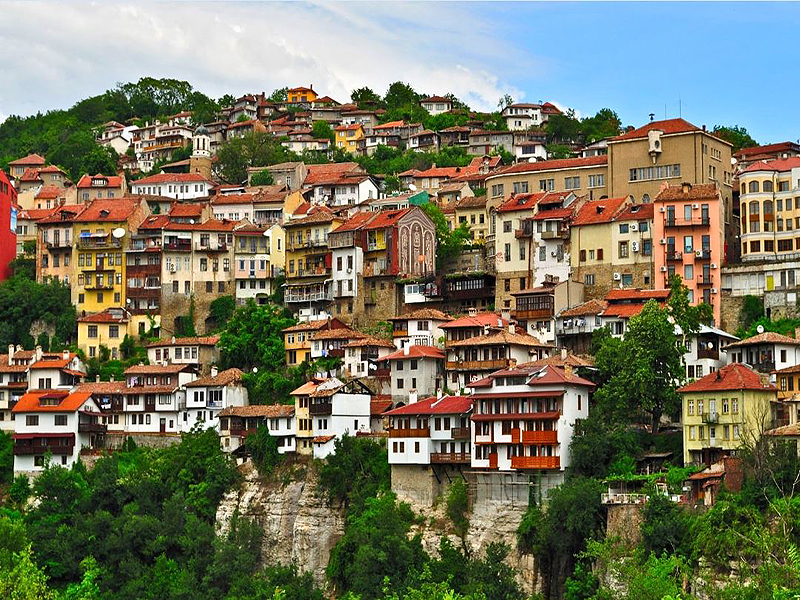 Besides being a medieval capital, Veliko Turnovo was also a Bulgarian National Revival city. Veliko Turnovo's 18th-19th century houses seem to grow right out of the steep slopes flanking the river and crowning them with their gables and overhanging eaves. In architectural terms, the appearance of the old part of the town takes the visitors in the past. Walking along Gurko street, the town guests have the possibility to see houses built over 200 years ago, as well as to sense a completely different atmosphere. Brought back to life in Veliko Turnovo are also the Samovodene market-place (the crafts streets) with its attractive small workshops where master goldsmiths, potters, carvers, weavers and pastry cooks still pursue their crafts, and the old photo studio. The market street is a kind of an ethnographic complex with crafts workshops, souvenir shops and galleries. The Monument to the Assens' Dynasty - the Bulgarian Royal dynasty reigning from 1185 until 1277. 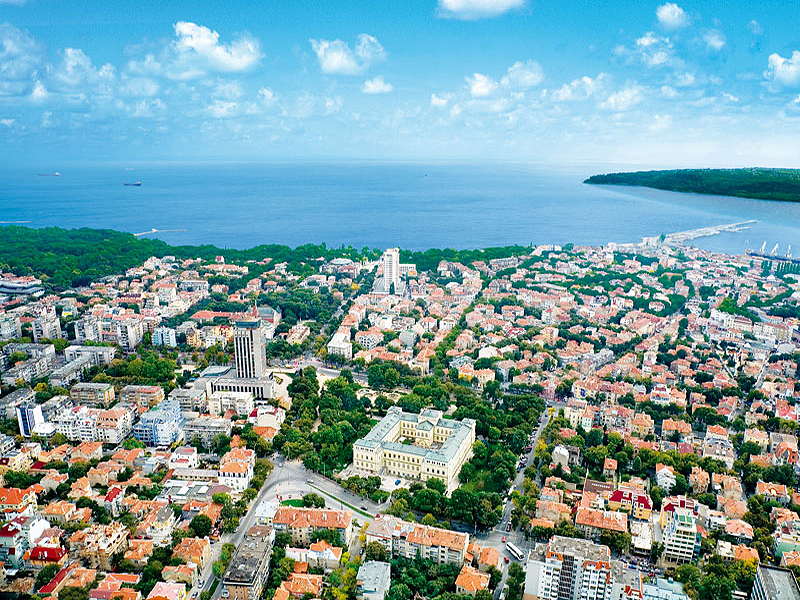 Gurko street provides a fine example of a typical Bulgarian National Revival-style architectural ensemble. The Samovodene Marketplace and the Sarafkina House (1861) - architectural and ethnographic expositions. The Museum of the National Revival and the Constituent Assembly (1872). 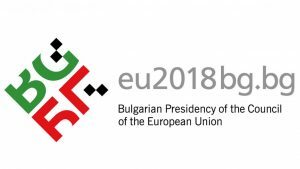 Here was adopted the First Bulgarian Constitution (1879) and the decision was taken to recognize the Unification of the Principality of Bulgaria and Eastern Roumelia (1885). The Archaeological Museum with its unique golden treasure from the Neolithic age (Hotnitsa golden treasure – 4100 BC) and the biggest collection of earthenware & pottery in Bulgaria, dating from Roman times. 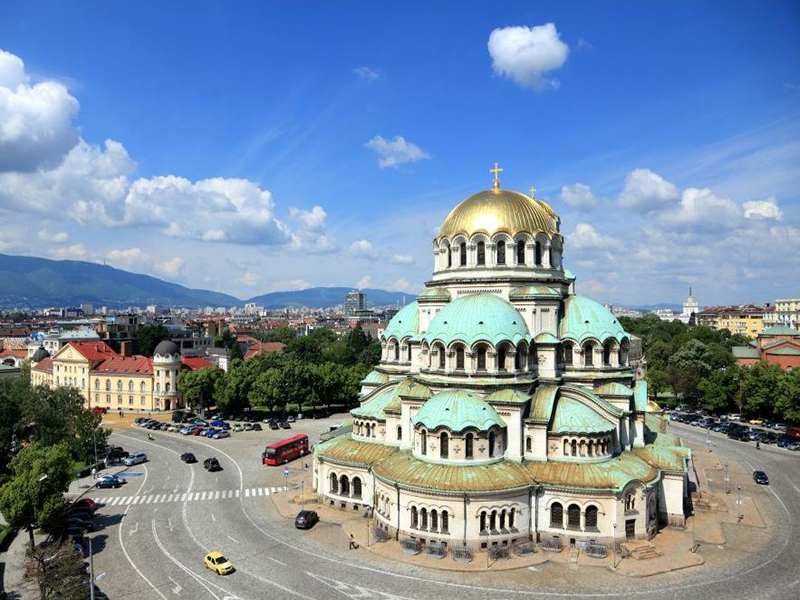 The St. Dimiter of Salonika church (1185) is the place where Bulgaria’s independence was proclaimed and the rulers of the restored Bulgarian state - tsars Assen, Peter and Kaloyan - were crowned. The Forty Holy Martyrs church was erected on the order of Tsar Ivan-Assen II in commemoration of the major victory of the Bulgarians over the Byzantine troops at Klokotnitsa in 1230. According to history experts, this is where tsar Kaloyan was buried. The incredible Sound & Light show presents the city's historic heritage to visitors in an original way. A spectacular show of dramatic music, multicolor lights, lasers and chiming bells are synchronized in a unique way to depict the tumultuous history of Bulgaria. Feel the magic of the ancient capital city of Turnov grad, illuminated with grandeur and glory, a city which became synonymous with the Bulgarian spirit and national pride!